Celtic necklace features a dome of Connemara marble in the center and interwoven filigree knot-work around -work along the edge. 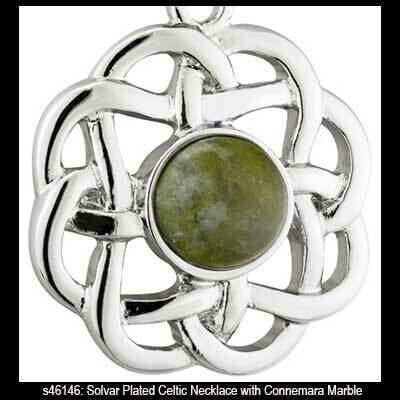 This Connemara marble Celtic necklace is finished in rhodium plating and it is enhanced with a dimensional dome of Ireland's green gem stone in the center along with filigree knot work along the perimeter. 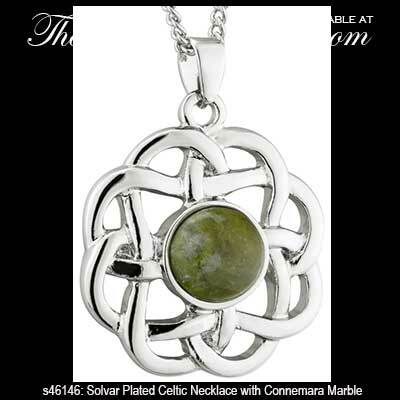 The Celtic necklace with Connemara marble measures 1” wide x 1 1/3" tall, including the jump ring and the chain bail, and it includes an 18” long rhodium plated chain.